Tasting room in the brewery. Ballast Point Brewing Company is an American brewery founded in 1996 by Jack White in San Diego, California. 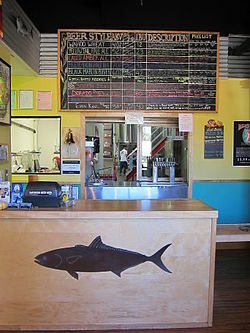 Ballast Point Brewing Co. started in the back of Home Brew Mart, a homebrew supply store White founded in 1992. As of 2015, it was the second largest brewer in San Diego County and the 17th largest brewery in the country based on sales volume. The company's main production facility is in Miramar. It also has brewery locations in San Diego's Little Italy and Scripps Ranch neighborhoods, as well as its original Home Brew Mart location in San Diego's Linda Vista neighborhood. In 2017, Ballast Point opened its first East Coast brewing facility in Daleville, Virginia, near Roanoke. Ballast Point was also the first microdistillery in San Diego since Prohibition. Following the sale of the brewery to Constellation Brands for $1 billion, the distillery will spin off to a new company named Cutwater Spirits. Founder Jack White developed a taste for beer in college. He and his college roommate Pete A’Hearn began home brewing in their apartment at UCLA. They found they had trouble obtaining the various supplies and ingredients they wanted, and had no access to other home brewers to share ideas with. In 1992, White opened Home Brew Mart in San Diego, selling the supplies and ingredients needed by home brewers. The shop also became a place where home brewers could communicate and share ideas with each other. Many of Home Brew Mart's customers went on to found breweries of their own, and the store has been credited with helping to launch San Diego County's reputation as a craft beer mecca. While White ran Home Brew Mart and dreamed of starting his own brewery, A'Hearn went off to the University of California, Davis to get a master brewer’s certificate. He became the company's founding brewmaster; however, he left the company soon after the launch of the brewery and became a science teacher. The two hired Yuseff Cherney, an award-winning home brewer, as Home Brew Mart’s first employee. A'Hearn and Cherney developed a “back room” brewery behind the shop, and in 1996, Ballast Point Brewing was born. The company takes its name from Ballast Point, a historically important site on San Diego Bay in Point Loma. By 2004, Ballast Point had outgrown its back room location and moved into a larger production brewery in Scripps Ranch. In September 2013, Ballast Point added a third location: a brewery, tasting room, and restaurant in San Diego’s Little Italy neighborhood, which functions as the company's laboratory for research and development. By the end of 2013, Ballast Point had outgrown Scripps Ranch. In mid-2014, Ballast Point finished construction on a 107,000 square foot brewery in the Miramar area equipped to support the brewery’s growth. Two large copper kettles discovered in a brewery in Lohr, Germany are the centerpiece of this new brewery headquarters, which also features a state-of-the-art laboratory, tasting bar, and restaurant. In 2008, Ballast Point Spirits was founded, with Old Grove Gin as its first product released. The Ballast Point Spirits family eventually included 14 spirits, as well as 2 cocktail mixers: Bloody Mary and Mai Tai. White served as CEO from the company's inception in 1992 until 2015. In 2012 Jim Buechler became the company's president and general manager, and in June 2015 he became president and CEO, leaving White with the title of Founder. Cherney is the company's chief operations officer and head brewer. In October 2015 Ballast Point Brewing & Spirits Inc. filed an initial public offering of stock. This offering would make it the first of San Diego County's breweries to go public. However, on November 15, 2015, Constellation Brands announced it would acquire Ballast Point Brewing & Spirits for $1 billion. The acquisition, which was completed in December 2015, was financed with a combination of debt and cash. By July 2016, four of the founders of the company, including founder White, chief operating officer Cherney, and CEO Buechler, left the company to "pursue other interests". Marty Birkel was named the new president of the brewery. The departures reportedly stemmed from disputes with the new owner, Constellation Brands, over the status of Ballast Point's distilled spirits operation, which was not part of the sale. White and Cherney plan to move that operation to a new company called Cutwater Spirits. They currently sell 16 different styles of beer. On June 12, 2017, Ballast Point opened its new East Coast Brewery and Tap Room in Daleville, part of Virginia's Roanoke Valley. The facility began producing beer in September 2017, with the first keg of Grapefruit Sculpin being sent to Virginia Governor Terry McAuliffe in Richmond. In 2010, Ballast Point won three gold medals for their beers, as well as the "Small Brewery Champion" award, at the World Beer Cup. In 2013 and 2014, Ballast Point's distillery arm was named the California Distillery of the Year two years in a row at the New York International Spirits Competition. ^ "Brewers Association Lists Top 50 Breweries of 2015 - Brewers Association". 5 April 2016. ^ "Ballast Point announces new brewery location in San Diego". Ballast Point website. November 4, 2013. Retrieved 3 April 2015. ^ "Beer lovers learn to brew-it-yourself". San Diego Union Tribune. September 12, 1999. ^ Elder, Adam (March 2010). "San Diego: America's Beer Capital". San Diego Magazine. Retrieved 22 November 2014. ^ a b Graves, Brad (October 19, 2015). "Ballast Point, S.D. 's No. 2 Brewer, Files for IPO". San Diego Business Journal. Retrieved 20 October 2015. ^ "Constellation to Acquire Ballast Point for $1 Billion". Brewbound.com. Retrieved 2015-11-16. ^ Tripp Mickle (November 16, 2015). "Constellation Brands to Buy Craft-beer Maker for $1 Billion". The Wall Street Journal. Retrieved November 17, 2015. ^ BeverageDaily.com. "Smart investments will further boost Constellation Brands' beer fortunes, says CEO". ^ Hirsh, Lou (August 2, 2016). "Founder White, 3 Other Leaders Leave Ballast Point Brewing & Spirits". San Diego Business Journal. Retrieved 3 August 2016. ^ "Past Winners: 2010". World Beer Cup. Retrieved 10 October 2013. ^ Levy, Adam (October 9, 2013). "New York International Spirits Competition 2013 Winners Announced". New York International Spirits Competition. Retrieved 3 December 2013.